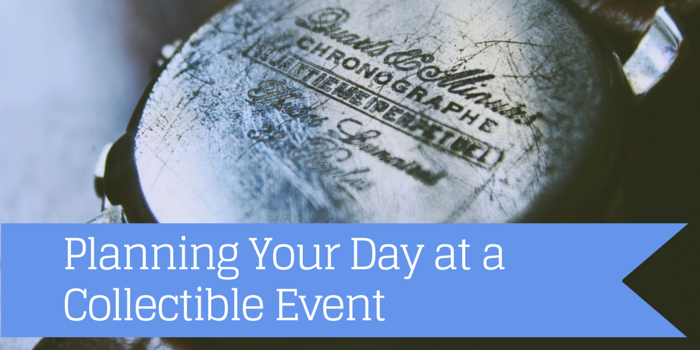 To make the day run smoothly at a collectible event, it would be beneficial to you to plan your day. This doesn’t mean you will have to have your day organised to what you will be doing each hour. It is important to research the event beforehand to know what to expect. The most important thing to know is where you are going. Even if you have a Satnav, printing off a map of your route can prove useful. To save time, find out where the nearest car park is and the pricing. It is vital that you know when the event will start and finish and allow yourself enough time to look around the event and a little extra time for lunch and tea breaks. Many collectible events will have food and drink there, although it is best to double check, especially if you don’t wish to bring your own food and drinks. If you know the collectible event will be outside, checking the weather forecast can prove very useful. Looking for all of these key bits of information will help you be more prepared for the day and not forget anything. Being prepared is key when attending any kind of event. Make sure you have the right clothing. If the forecast says that there is a chance for rain then take a raincoat or umbrella. You will certainly need something if it rains. Even if you are most likely to buy your food and drinks there, bringing your own will prove valuable. You never know on the day what the prices could be or if they will run out of food. If you have any dietary requirements, bringing your own food is a brilliant idea, as then you will know how everything has been prepared and can avoid any complications. Once you have bought the items you needed you can store them away in a storage unit. This will keep them safe and will give you a bigger space to expand your collection.